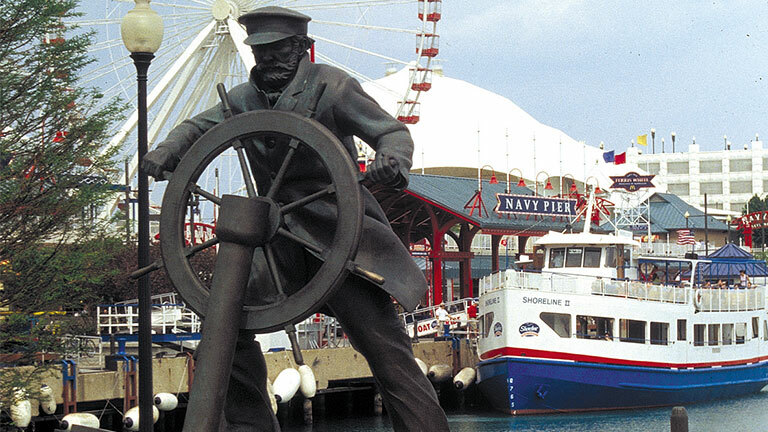 Head over to Navy Pier and explore a true Chicago landmark. For more than 100 years, locals and visitors have been coming here for an authentic Windy City experience. Literally, windy. After all, it's hard to stretch 1.5 miles out into Lake Michigan without feeling a gust or two. Chill out in 50 acres of parks and gardens. Check out the expansive views of the Chicago skyline and waterfront by foot, bike, skate, or boat! Have you heard of the Centennial Wheel? It rises about 200 feet into the air and offers some of the most boffo views of the 312 you can get. Instagrammable? check! (Sidebar: they even host speed-dating events on the wheel from time to time . . . yeah, because as if speed dating isn't scary enough, now you're being lifted 200 feet in the air to meet a stranger!). Grab some grub from the Classic Food Court and seasonal outdoor kiosks, or wine and dine in local favorites like Riva Crab House. Catch an Imax flick or a bit of the Bard at the Chicago Shakespeare Theater. Oh yeah, they've got great live tunes at the Pier too! Especially in the summer - Live bands galore - WORD! Get your shop on at the funky boutiques. Then kick back with awesome fireworks all summer long. This is serious fun. Cruise the pier anytime of day or night. Opening hours for shops, restaurants and venues vary. Get ready for explosive fun! The bi-weekly Aon Summer Fireworks show happens on Wednesdays and Saturdays throughout the summer, from Memorial Day through Labor Day. Find your favorite spot and prepare to be entertained with spectacular fireworks that are perfectly synchronized to music over Lake Michigan. Special shows are also scheduled throughout the year, so check the Navy Pier schedule to see what's happening when you're in Chi-town. are there kid's activities at Navy Pier? Keeping the kids entertained is easy, starting with the Chicago Children's Museum, where the younger crowd can dig for bones, scale a three-story schooner, and splash in the water playground. The Zoom Room is the ultimate toy car experience, where kid's are in the driver's seat (of toy cars, of course)! There's even the Stroller Derby, where parents and kids can get fit together. With all this fun, long naps and early bedtimes are virtually guaranteed.